Greek music has had somewhat of a revival in Melbourne in recent years, with a spate of new bands popping up at venues across the city. The Greek Centre has added many of these bands to its successful Live at the Greek music series, running fortnightly in Lonsdale Street. This injection of local talent has also been welcomed by the Lonsdale Street Greek Festival, which continues to program a diverse range of bands from Melbourne, but also interstate. Each year the Festival brings a major international act to the Festival, with the likes of Eleftheria Arvanitaki, Haris Alexiou, Dimitra Galani, Alkistis Protopsaltis, Mihalis Hatzigiannis and Alkinoos Ioannides. This year’s main act, Giannis Haroulis, hails from Crete and has in recent times become one of the most successful artists in Greece. His concerts are energetic, and his ability to connect with his audience has seen his career go from strength to strength. In addition to the 100 or so shows he performs each year, he has also recorded music for television including the incredibly successful series “The Island” (based on the book by Victoria Hislop). In addition to Haroulis who already has a strong following in Melbourne, we are proud to present some wonderful musicians including Agapi and Friends, Dio + Dio (& Friends), Galata Express, Melbourne Rebetiko Ensemble, Mikri Compania, The Taxithi Project, Totally Kicking Brass, Zourounna, Glendi Band, The Habibis and so many more. Bringing colour to the street are the myriad of dancing groups from Melbourne, Darwin and even Western Macedonia. To cater for the increase in attendees to the Festival over the years, the event is now preparing to expand its offering along Lonsdale Street, from Swanston Street up to Exhibition Street. The event takes over the historic Greek precinct with free entertainment across three stages, street food, pop-up bars, cooking demonstrations, competitions (new and old favourites), children’s activities and much more. Three performance stages will be positioned along Lonsdale Street, where local and international acts will captivate audiences. Take an OPA-CIZE class, or cheer on the Zorba ‘til You Drop participants as they dance non-stop for a chance to win a return trip to Greece. 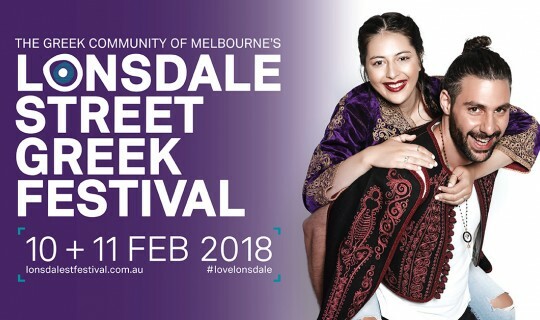 The Lonsdale Street Stage will host the Magic Mic singing competition as well as a number of local and interstate dancing groups reflecting the many regions of Greece plus an outside broadcast from SBS Radio and DJs from Rythmos Digital radio. Cheer the longest running Greek dance-a-thon in the world! The Festival’s annual Zorba til’ You Drop competition is the ultimate test of endurance as contestants dance the traditional Greek “Hasaposerviko’ dance (made famous by Anthony Quinn), non-stop for a chance to win a return trip to Greece. My Kitchen Rules Greek twins Helena and Vikki Moursellas will be hosting the Procal Greek Kitchen across the weekend. Presenters will share their favourite recipes with attendees and come dusk, the Greek Kitchen transforms into an intimate ‘ouzeri’ with many styles of Greek music being played, and lots of dancing encouraged. Slip on your stretchy pants and bring a healthy appetite to the Festival because Lonsdale Street will be lined with food vendors all weekend dishing up classics and modern twists on Greek treats. Just some Festival traders include: The Cypriot Kitchen, St. Gerry’s, Cypriot Street Food, Greek Trojan Yiros, Goody’s Burger House, Ilias the Greek, To Nostimo, Two Men and a Lemon, Oasis Coffee, Greek Mama’s Kitchen and many more. Lonsdale Street Greek Precinct Stewards Stalactites, Tsindos and International Cakes will extend their trading out onto the street as well as whisky bar Boilermaker House. The outdoor Festival bar is the ideal place to sit back, sip on a range of Greek beverages and take in the festivities. Keep the little ones entertained with a weekend-long program of entertainment and activities. In the KIDS ZONE, enjoy face painting and craft activities all weekend. Show us your bike! Cycle to the Festival and we’ll shout you a coffee. Come past the Accreditation Tent at the corner of Russell & Lonsdale Streets and we’ll give you a voucher to use at the Festival. The 31st Lonsdale St Greek Festival is a Greek Community of Melbourne event. It is held in Lonsdale Street Melbourne on Saturday 10 + and Sunday 11 February 2018.